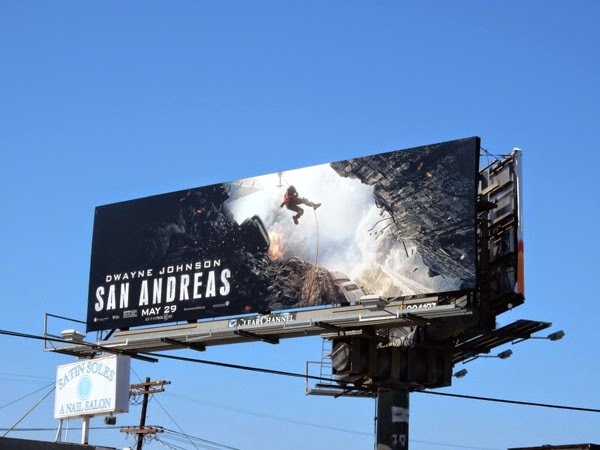 After the devastating major earthquakes in Nepal recently, now probably isn't the best time to be marketing a movie based on an apocalyptic earthquake event along the San Andreas Fault. 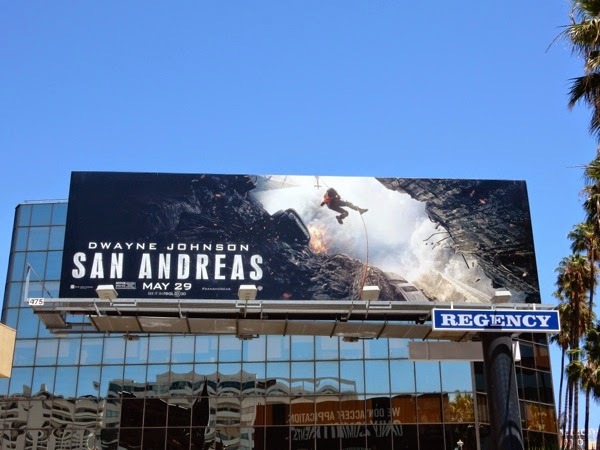 In fact being based in Southern California and watching the trailers for Dwayne Johnson's new disaster movie have made Daily Billboard feel positively queasy (and rush to ensure we have sufficient emergency earthquake supplies). 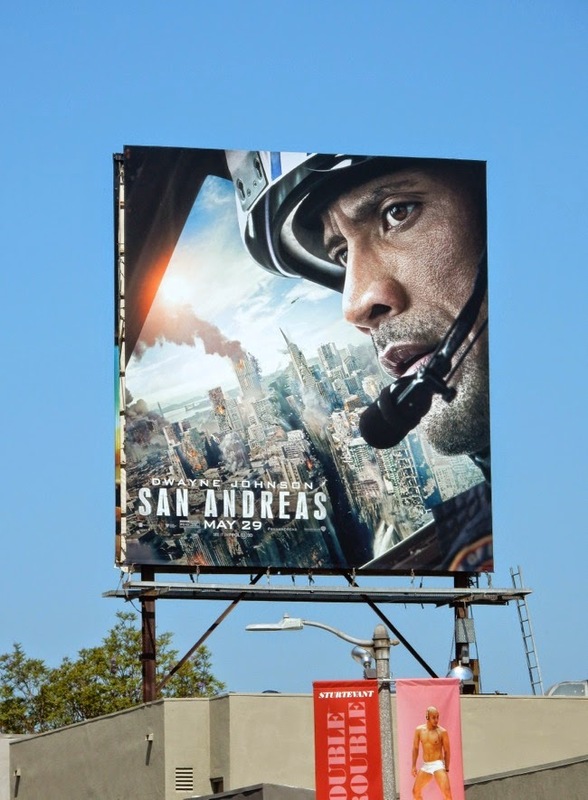 But from the looks of San Andreas, not matter how many windup flashlights, bottled water or canned goods you may have in case of an emergency, it won't do you any good unless you have a handy helicopter to save the day and get you out of the danger zone. 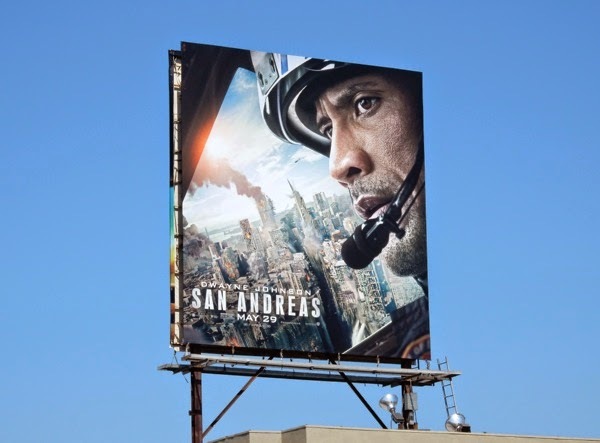 In the action-adventure thriller Dwayne Johnson stars as an L.A. Fire Department rescue helicopter pilot who along with his ex-wife, played by Carla Gugino, fly to San Francisco to rescue their daughter (Alexandra Daddario) after a disastrous earthquake hits California. 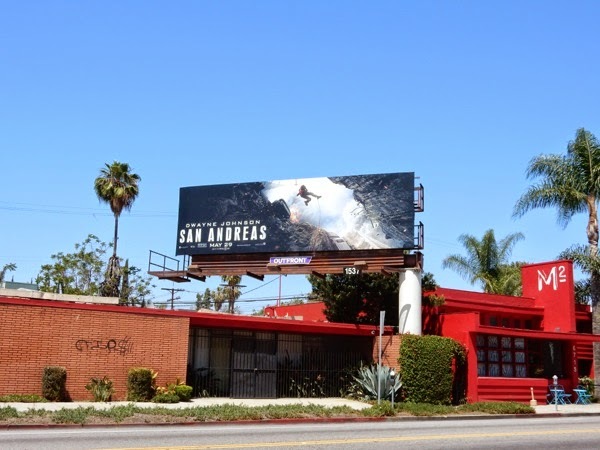 It's not been the first time we've since L.A. devastated on the big screen, as The Day After Tomorrow, 2012 and Battle L.A. have all taken their shots at the City of Angels with tornadoes, end-of-days seismic events and even alien invasions. 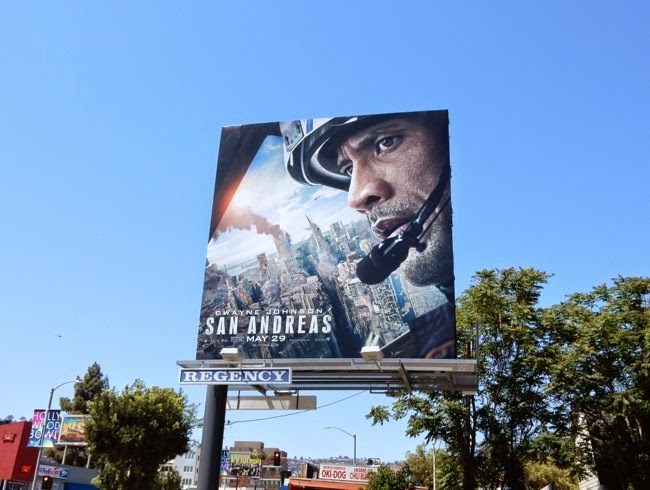 These San Andreas movie billboards were spotted around the streets of L.A., from Sunset Boulevard to Melrose Avenue, Hollywood Boulevard to Fairfax Avenue, 3rd Street to Beverly Boulevard on May 10, 2015. 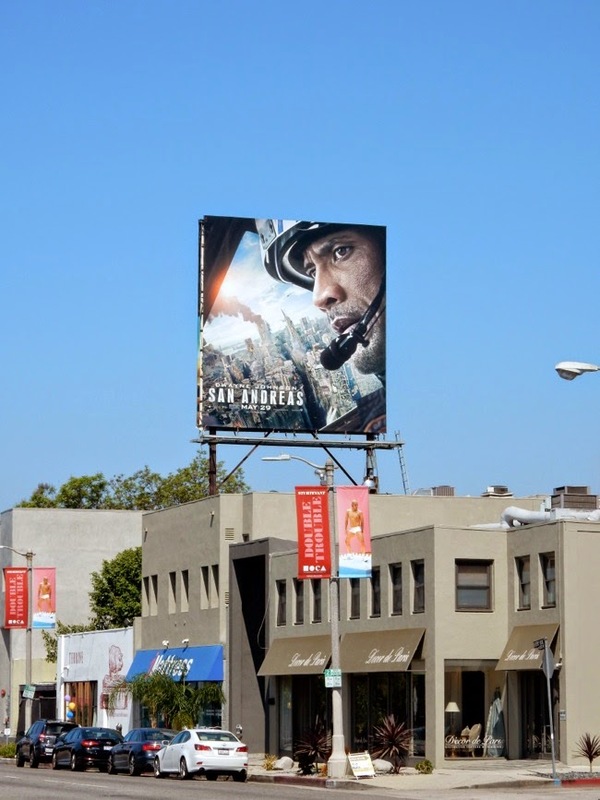 If you're a fan of The Rock, be sure to check him out in these Hercules movie billboards, Pain & Gain film billboards and these G.I. 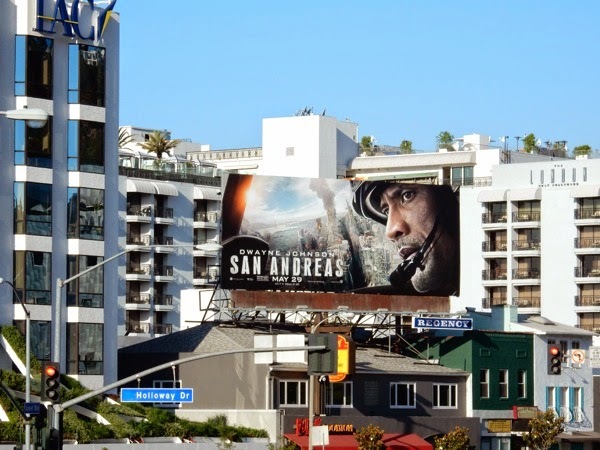 Joe: Retaliation movie billboards. 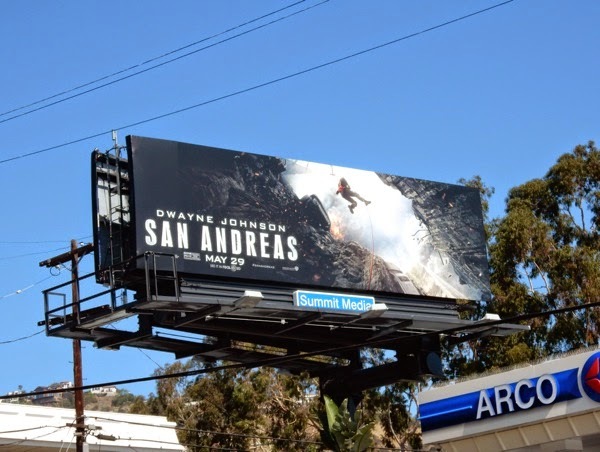 Here's keeping everything crossed that San Andreas isn't the shape of things to come, and is an epic movie and not an actual omen. Plus if you want to do your part to help those affected by recent events, you can donate to the Red Cross Nepal Earthquake Relief and other charity relief efforts. 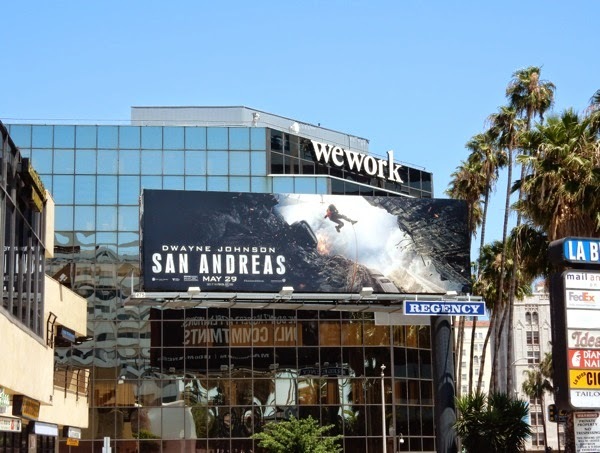 UPDATED: Here's also landscape version of the billboard featuring Dwayne Johnson's face and the earthquake devastation in San Francisco snapped along West Hollywood's Sunset Strip on May 19, 2015.